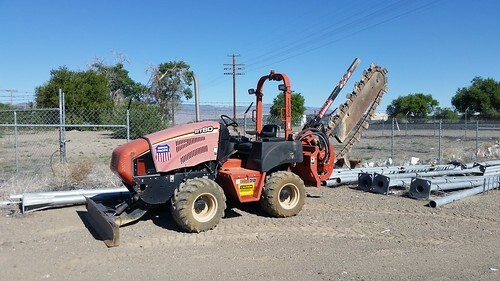 Because Maintenance-of-Way forces for the Nevada Subdivision of the Union Pacific are based out of Fernley, I sometimes get to see odder pieces of equipment. This trencher is used for digging where they put the conduits for the signal lines. It sat in the yard here for a couple of days. Monday morning, when I went for a short walk, I saw a UP crew securing it on a trailer before taking it to its next assignment. I do like having this window seat on the railroad. I only wish the house (and lot) was turned 90° so we'd have a better view from the living room windows than we do. OTOH, maybe it's just as well that my only direct view from my work space is a small window; otherwise, I might not get any work done!